The Monkey 2017 horoscope asks you to make sure that you keep yourself flexible this year. It will greatly help you out at both work and with your friends. Being flexible will also make your year more interesting in general. Let people know what you want out of this Chinese New year instead of just going with the flow or what other people want. While you may feel self-centered by doing this, it is bound to make 2017 more enjoyable. In Chinese astrology, each of the twelve signs are named after an animal that seems to represents the sign’s traits the best. If you were born in any of these years (1944, 1956, 1968, 1980, 1992, 2004, or have a child being born in 2016) then you fall under the Chinese monkey sign. In general, monkey people tend to share many of the same traits. The 2017 Chinese horoscope predictions for Monkey show that they are highly sociable people and can solve just about any problem that you throw at them. Of course, at times their ego can get the better of them and they will focus on themselves more than others. In general, monkey people are full of good traits that will be able to help them in the Chinese lunar year 2017. The Monkey 2017 predictions foretell that your love life will be both harmonious and exciting this year. You are likely to reach a stable level in your relationships, friendly or romantic. But this doesn’t mean that things will get boring with your partners or friends. If you want things to advance in any of your relationships, then you will need to better express your emotions to the people who you care about. This will make it so they can better understand you and your intentions even it is about planning a pregnancy. The 2017 Chinese zodiac forecasts also says that this can make things more romantic or sexually intense as well for the monkeys. Listen to your partner if you have one. Take their feelings and ideas into consideration. Who knows? It could make your relationship all the more romantic as well. Your feelings will dominate your thoughts, but it will be what you do with these thoughts that will affect your relationships. In years past you may have kept quiet at work; you may have only worked for the money. The 2017 Monkey horoscope tells that this year, feel free to express your own creative ideas. Who knows? Your ideas could be the difference between a raise or a monotonous career. Do not let your personal life get in the way of your job or business. This may affect how your bosses and partners think about you. This doesn’t mean that you cannot make friends at work though. In fact, making friends with your bosses and coworkers can actually increase your chance of getting a raise or promotion. The Chinese horoscope 2017 Monkey predictions ask you to keep yourself sharp by working hard at work and doing fun mental puzzles in your free time. Transform yourself into the ideal worker! The Monkey horoscope 2017 asks you to keep a close eye on your finances this year. You may have to make some sacrifices when it comes to having fun with your money. But it will make your bank account better balanced. It will help you in the long run if you save your money and pay off debts this year. The Chinese year of the rooster 2017 predictions for the monkey foretell that you are likely to be very busy this year with work, friends, and your hobbies. This is likely to stress you out at times. Don’t let your stress get the better of you or else you may fall ill. Don’t let the little things get to you, but do let little happy things improve your day. Continue to be generally optimistic and it will be able to slightly improve your year no matter what else comes your way. Alternative healing can help relax your mind. 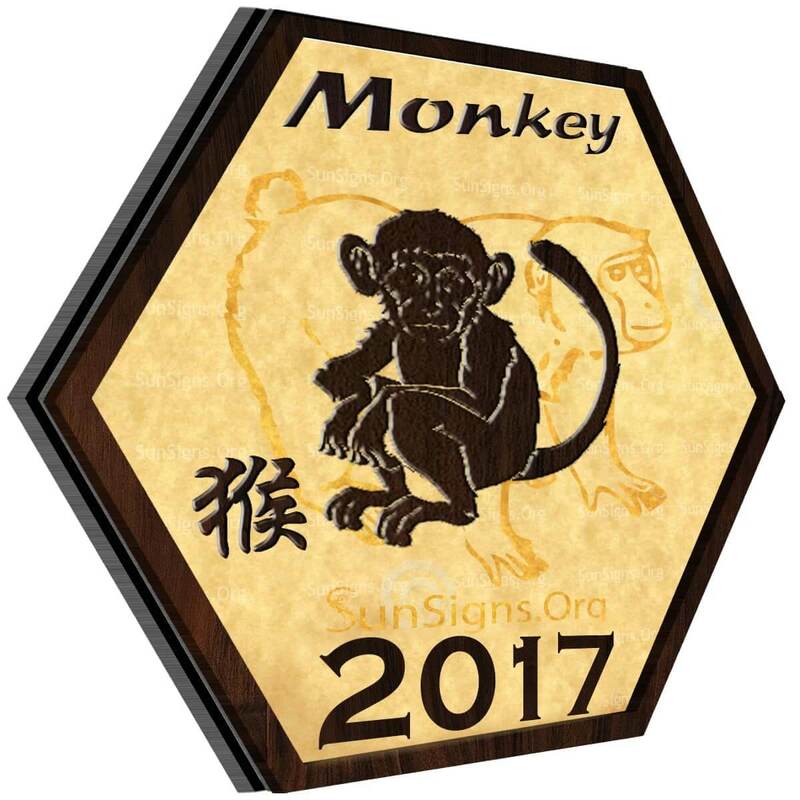 The 2017 Feng Shui monkey forecasts suggest a good year in terms of career and money. If you plan to start a business, here are a few Feng Shui tips for your new office. The monkey horoscopes 2017 suggest that this year you are likely to feel like you finally have the freedom to do what you want. Work on your hobbies or goals that you may have been putting off in past years. While these hobbies may not make you rich and famous they are such to at least let you have a good time. it seems like another tough year, july 27, 1968 5:22 pm still have difficult times, just like last year, is there anything positive I can look for? same here….. when will it end???? I always see 143 and 341 numbers any where what does it mean?